I know, let’s rewrite history! Regular readers will remember that I am not very fond of the Frieze art fair because it charges so much, because it lands in Regent’s Park like a giant Borg spaceship, but mainly because it reinforces the market driven orthodoxies of contemporary art. Perhaps you will think this unfair of me. It (and I am including the technically separate Frieze Masters in all this) is now a globally pre-eminent forum for art. I just don’t like festivals…I don’t like being force fed. Art, when it works in my life is like adding salt to my food – it makes it taste of something, makes me enjoy it more. Frieze Art Fair is basically just a mouthful of salt. Tastes horrible and makes me feel sick. 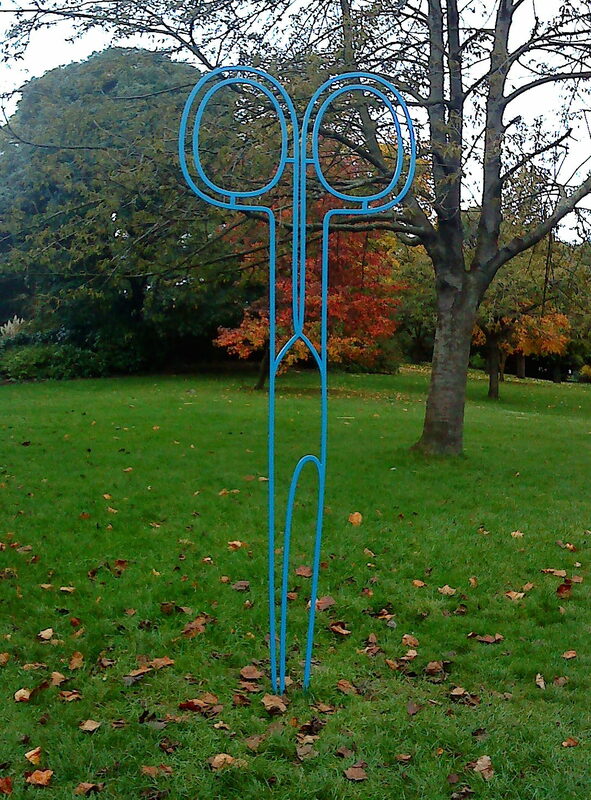 Notwithstanding this found myself in the park with some sculptures, some of which were quite successful I thought. Michael Craig-Martin was in my bad books for a long time for calling drawing ‘a trick with a pencil’. You have only to look at his work to realise though that he is engaged with drawing in its pure form. His coffee cup was the standout work at the RA summer show (Yes I did go, really!) and these blue scissors were also very eye catching. The linear nature of the object – see through but solid was very clever. And offered a neat contrast with the coffee cup, which was just black tape on a solid wall. 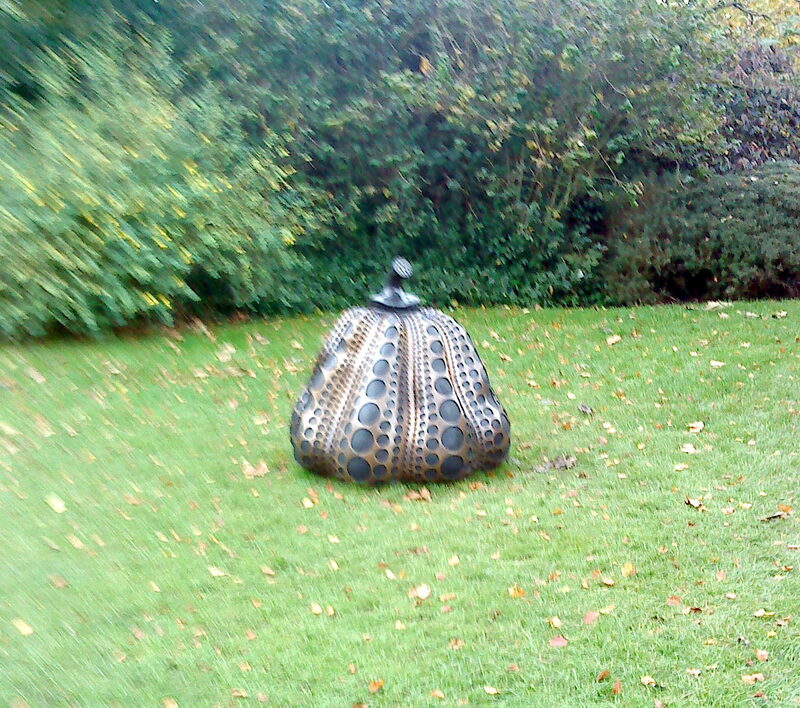 Yayoi Kusama’s pumpkins also caught my eye – reminding me a little of some sci-fi design, and yet feeling curiously traditional. The one pictured has a certain squat bodily quality, but the hard geometric patterns in the bronze conflict with that. It seemed to have cleared the space around it: it was a little unsettling, ambiguous. Meanwhile back in Berkeley Square, the new hq of Phillips auctions is hosting ‘a Very short history of Contemporary Sculpture’ curated by Francesco Bonami. Firstly this new space – if it’s going to have shows all the time, I don’t know – is a very smart one indeed. The quality of the works on show was also high. I am always sceptical about curation, and the mediation that it implies. But when it is explicit (as here) rather than surreptitious (as at Frieze) that what you are looking at is the result of personal choice, I can live with it. What was striking to me in this choice was the absolute dichotomy between the high serious abstract sculptors and the joky irony of the figurative ones. 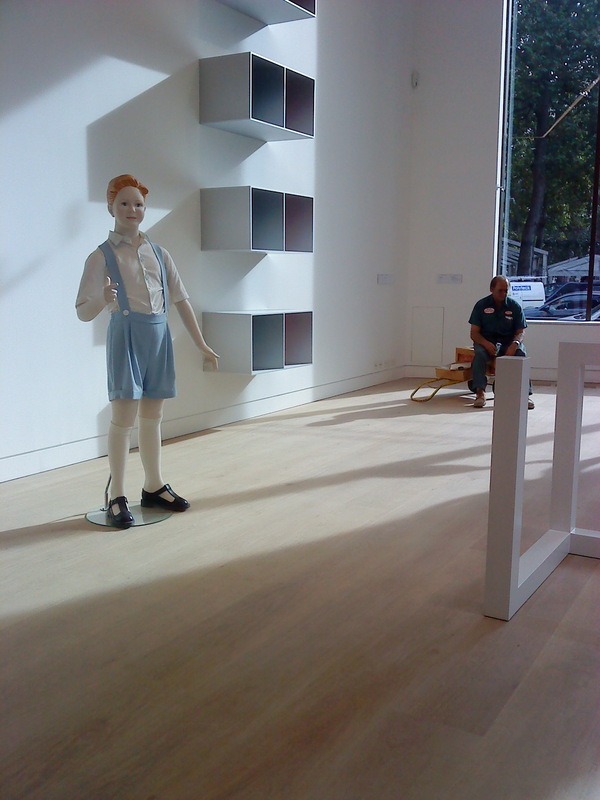 In the abstract er…corner Carl Andre, Donald Judd and Sol LeWitt were all present and correct. In the figurative corner Louise Bourgeois, Keinholz and Thomas Shütte offered us a figurative vision where appearances were deceptive and playful in stark contrast to the concrete and literal work of the minimal artists. Hmm. Bruce Nauman’s Henry Moore Bound to Fail was tucked away in a corner and I struggled to explain to myself why this had been such a key work for us as students (if you’re reading this RG, perhaps you can remind me) Perhaps because he was trying to cross that divide somehow. Rather against my low expectations of her work, Rachel Whiteread’s door does seem to bridge this gap. At once concrete (literally, but also in the sense of absolute form) and joky (casts are always a bit joky) this work stood very neatly at the crossroads of all the strands of sculpture shown here. I still find this idea of casts upon which she has built a whole career almost totally derivative of Bruce Nauman’s cast of the space underneath his hotel chair. But he only made one of those I think. That will never fill up auction catalogues. Or art fairs. This entry was posted in Art, Auctions, Contemporary, Galleries, Sculpture, Uncategorized and tagged Abstract, Auction, Berkeley Square, Bruce Nauman, contemporary art, Contemporary Sculpture, don judd, Frieze, Frieze art fair, Galleries, Katsuma, London, Michael Craig-Martin, Photographers' Gallery, Rachel Whiteread, Sculpture.